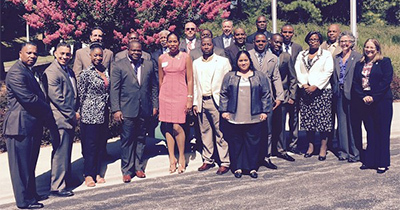 On July 24, 2015, the Bureau of Alcohol, Tobacco, Firearms and Explosives (ATF) National Laboratory Center held its very first graduation for the Caribbean firearms examiners class. This 12-week course in forensics was given to selected members of countries in the Caribbean Basin Security Initiative (CBSI) program to provide instruction and training in the identification of weapons and ammunition, proper documentation to facilitate firearms and explosives traces, current trends in firearms, and intelligence gathering techniques. ATF joined the CBSI program in 2012 under an Inter-Agency Agreement (IAA) with the U.S. Department of State to serve as the U.S. agency implementer in the effort to combat illicit firearms trafficking in the Caribbean Basin. The ATF program was designed to assess the scope of regional firearms trafficking in the Bahamas, Trinidad and Tobago, Dominican Republic, Jamaica, Anguilla and Barbuda, St. Kitts and Nevis, and Barbados, and to address the problem through constructive, capacity building and advisory partnerships with the relevant authorities in each of those nations. Attendees of the graduation included Jamaica Security Attaché Oral Pascoe, Bahamas Ambassador Dr. Eugene Newry and his wife Francoise Torchon Newry, Deputy Chief of Mission Chet Neymour, Second Secretary Krissy Hanna, St. Kitts Chargé d’affaires Justin Hawley, and Counsellor Ms. Kemoy Liburd Chow. ATF looks forward to the continued sharing of expertise in our efforts to stop illegal firearms trafficking to the Caribbean.